Peconic Landing is excited to announce it will be hosting its annual End of Summer Celebration and fireworks show for the fourth consecutive year. Greenport, NY - August 10, 2015 - Peconic Landing is excited to announce it will be hosting its annual End of Summer Celebration and fireworks show for the fourth consecutive year. The much-anticipated event is free to all and attracts more than 700 guests each year. Join us Sunday, August 30 at 7 p.m. for a live performance by the forty- member Atlantic Wind Symphony, which is comprised of musicians from across Long Island. 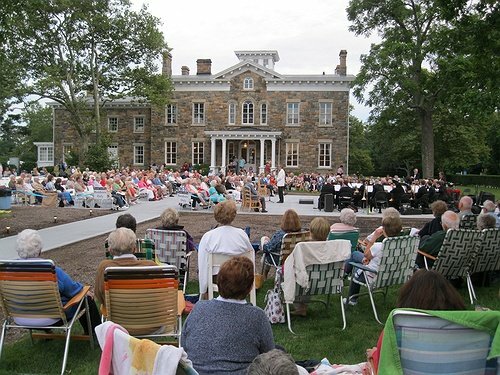 The performance will take place on the patio at Brecknock Hall and feature popular songs by George Gershwin, John Philip Sousa as well as well-known Broadway hits. It will also include a salute to Veterans and current service members. The performance is sponsored by the Brecknock Hall Foundation, which has a mission of maintaining the beautification and preservation of the historic mansion. Fireworks will take off about 8:15, launched over Peconic Landing’s community pond. Guests are asked to bring a blanket and chairs to make the most of the event. The 20-minute fireworks show is sponsored by Peconic Landing. A rain date is scheduled for September 6 at 7 p.m. Peconic Landing is located at 1500 Brecknock Road in Greenport. For more information, visit www.peconiclanding.com. Peconic Landing is an innovative, not-for-profit CCAC-CARF-accredited continuing care retirement community (CCRC) located on the waterfront in Greenport, N.Y., on the North Fork of Long Island. Among its long list of achievements, Peconic Landing is the only equity-based LifeCare community in the state of New York. It is a member of LeadingAge and LeadingAge New York and embraces a healthy, active lifestyle infused with a sense of exploration, creativity and generosity of spirit. Subject: LongIsland.com - Your Name sent you Article details of "Peconic Landing to Host End of Summer Celebration"